LANSING, Mich. — Sen. Tom Barrett, R-Charlotte, was sworn in as senator for the 24th District on Wednesday during a ceremony at the state Capitol. Michigan Supreme Court Chief Justice Stephen J. Markman administered the oath of office. 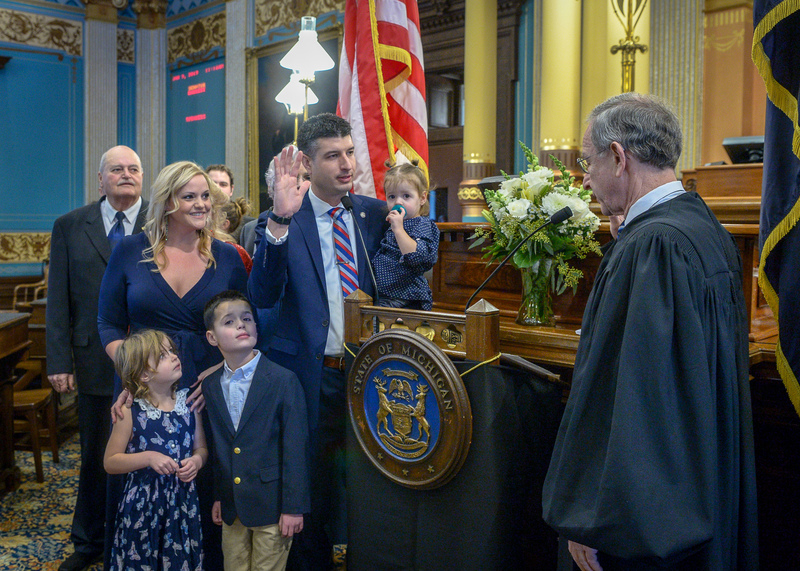 Barrett was joined on the Senate floor by his wife Ashley and their children Patrick, Eleanora and Gwendolyn. Barrett’s father Patrick, mother Mary Anne, father-in-law Patrick Allen, mother-in-law Jeanene Allen, and family friend Louanne Planchon were also in attendance for the ceremony. Editor’s note: The above photograph of Barrett is available by clicking on the image or by visiting www.SenatorTomBarrett.com/Photos. Video of the swearing-in ceremony will be available at www.SenatorTomBarrett.com/Video.